This post has 2,913 views. The monitor I picked up was a Dell E2414Hr, which is a 24″, 1920×1080 (1080p) monitor from Dell’s current economy LCD monitor line-up. 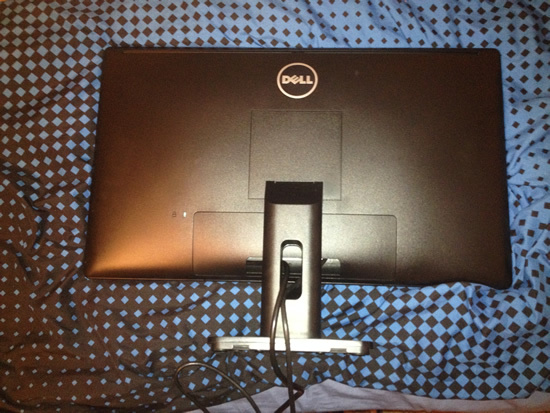 Dell also has the E2414H, which from what I can tell is exactly the same monitor, but the E2414Hr model number only comes with a VGA cable while the E2414H also includes a DVI cable. As this is the economy line, the monitor comes with a TN panel and only DVI and VGA connections. I have a I have a top-of-the-line Dell Ultrasharp U2412M at my office and that monitor is wonderful, but I don’t feel like spending $270 on a monitor. 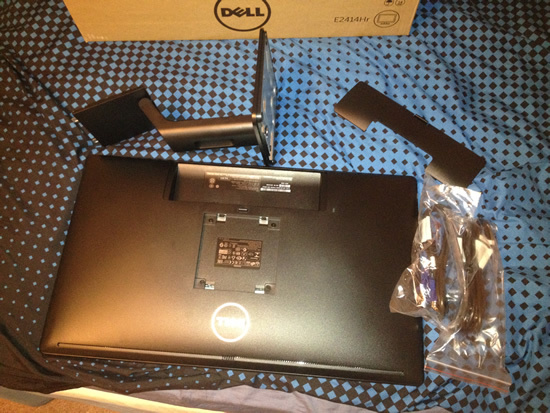 I thought about getting the Dell Ultrasharp U2312HM which was selling for about $170 during the Black Friday period. Compared to the E2414Hr, the Ultrasharp comes with a superior IPS panel with better color and viewing angles, a much more adjustable stand, the ability to rotate into portrait mode, a DisplayPort connector, and an integrated USB hub. In the end, I decided the extra $70 is better spent elsewhere and picked the cheaper E2414Hr instead. There is not much to say about the box, so please excuse the blurry picture. 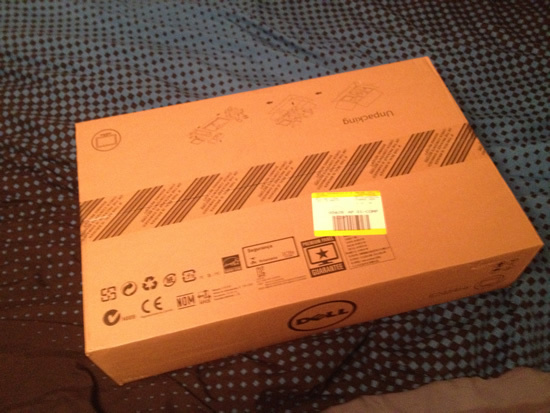 The E2414Hr came in a nondescript cardboard box. It was so nondescript that it took me a little while to identify the box as the product I wanted while I was looking around at Best Buy. Prettier packaging would be nice, but as long as what’s inside is working and well-protected then I have no problems with just a brown box. Nondescript packaging to go with the nondescript box. The contents of the box laid out. Opening the box reveals the contents. The stand and the base come in separate bags, and the package also includes a driver CD, quick-install guide, VGA cable and power cable. 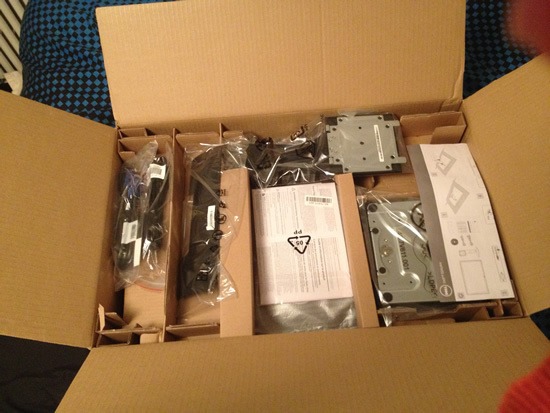 Again, the packaging is nothing to write home about, but everything was secure and protected. The back of the E2414Hr with the cables connected. When the panel is installed, the cable connectors are hidden from sight, giving the whole back a sleek appearance. Unlike the box, the monitor itself looks quite nice. I like the matte black finish and minimalist design of the E2414Hr, and the whole thing feels pretty solid. The stand pops into square in the back of the LCD with a pretty clever mechanism. The base has to be screwed into the stand, but the screw can be easily rotated with your fingers. The back of the monitor looks particularly nice, and I love how the E2414Hr has a little panel to cover up the cable connectors to give the monitor a really neat and organized appearance. Too bad I’ll mostly be looking at the front of the monitor . The E2414Hr has a DVI connection and a VGA connection. An HDMI or DisplayPort connector would be nice, but since the monitor is only $100 I can’t complain too much. The stand has a hole for the cables to go through. The only adjustment available is a couple degrees of vertical tilt, but that’s fine for my setup. 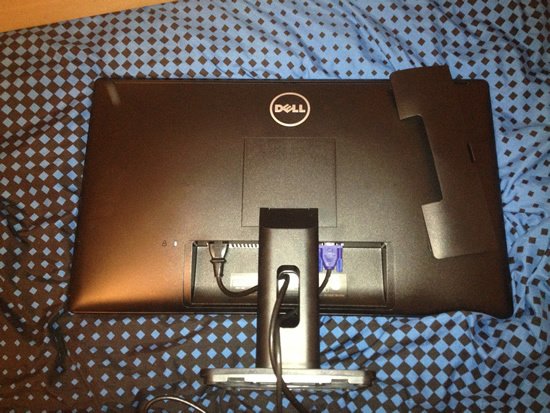 The stand is a little short, so I put a phone book underneath the monitor to prop it up to the proper height. I had thought about buying a desktop monitor arm, but if the phone book works then I’m not going to spend the extra $60-$100 for a nice monitor arm. From the front, the E2414Hr has a simple design with a thin matte black bezel. The power button is on the lower right corner and lights up bright white when the monitor is turned on. There are four more small black buttons above the power button which allows the user to access the onscreen menu and adjust the parameters of the monitor. The onscreen menu looks pretty nice, although the only setting I played with was turning down the brightness. My new desk setup with the E2414Hr above my laptop screen. After assembling the monitor, I hooked it up to my laptop with the VGA cable, and everything worked as expected. There aren’t any stuck pixels or defects, and text and pictures look clear and better than the 14″ screen on my Lenovo ThinkPad T410. My first impressions of the E2414Hr is definitely positive, and hopefully this monitor will last a long time. For only $100, E2414Hr was a good deal. 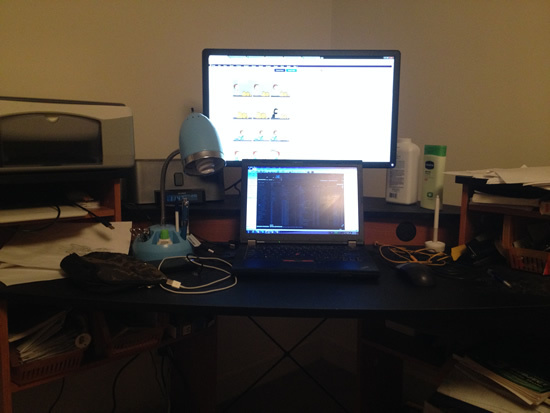 I have the E2414Hr positioned behind and above my laptop, and the arrangement has worked pretty well. Now I finally a big second monitor to use at my apartment, just like I have at the office, and I think this purchase will actually help my productivity when I’m back at my apartment… or at least I hope. In addition to the monitor, I also bought a cordless vacuum, a car GPS, a car dash camera and an Android tablet. I’ll likely write about the GPS, dash camera and tablet on this blog once I receive them and test them out. I think my Black Friday spending this year exceeded what I spent in my previous years in the US. Now that Thanksgiving break is coming to an end, I have to get back to work again. The semester only has one week left, and I am set to take my PhD candidacy exam very soon so I have to prepare. As I move ever so closer to my graduation, I also have to start looking for a job. While my PhD dissertation research is nearing completion, I’m sure my adviser will have other things for me to work on, so there will be plenty to do in the next couple of months.